Before automatic drip coffee makers, known in the industry as dripolators, hit the scene in the 1970s, every kitchen stove had a percolator on it. While dripolators sprinkle hot water over ground coffee only once, percolators draw liquid up from the pot and sprinkle it back through the grounds more than once, making for a stronger, richer brew. Look for coffees specifically ground for percolator use, though they can be hard to find these days. 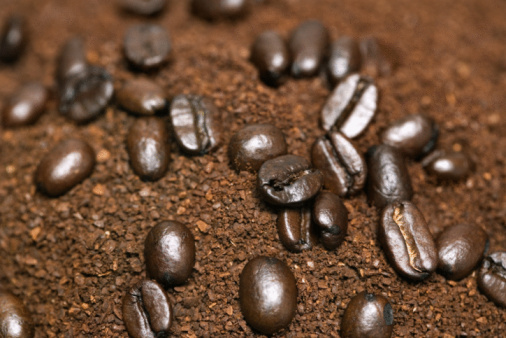 If you have to settle for coffee labeled as "suitable for all coffee makers," opt for the coarsest grind, or buy whole beans and grind your own. Wash and dry all parts of the percolator before you use it the first time. This will remove any shipping or packaging dust. Fill the coffee pot with water for the desired amount of coffee as indicated by the fill lines inside the pot. Use bottled or filtered water if you live in an area with especially hard water. This isn't an issue as far as mineral deposit build-ups in percolators like it is with dripolators, but hard water can affect the taste of your brew. Set the basket stem inside the pot, then place the coffee basket on the stem. Percolators do not require a paper filter. Spoon 1 tablespoon of coarsely ground coffee per cup into the basket. For example, for a full pot use at least 12 tablespoon of coffee. Use less for weaker coffee, if you like. Using more would result in something resembling jet fuel, so be cautious. Place the lid on the pot and turn the lid into the locking position. Plug the electric cord into the machine then into a wall outlet. The coffee pot will begin to perk automatically, once it is plugged into the power source. Allow approximately 1 minute per cup for the coffee to perk. The ready light will glow when the coffee is done. Fill the coffee urn with water to the appropriate water gauge line marked inside the urn. Place the stem and basket into the urn. Measure coarse-ground coffee into the coffee basket. A full 40 cups may take 2 1/2 cups or more of coffee for full flavor. Attach the lid to the machine. Plug the electric cord into the coffee urn and the opposite end into an electrical outlet. The coffee urn will begin brewing automatically. Watch for the blue light to appear as this indicates the coffee is brewing. The blue light will turn green when the coffee is ready to serve.